Bir Tawil is deserted land on the border between Sudan and Egypt that has with no trace of permanent inhabitants. Map showing Bir Tawil (white) between Egypt and Sudan. Bir Tawil refers to unclaimed land found on the border between Sudan and Egypt. The area covered by the land is 795 square miles. Bir Tawil is deserted with no trace of permanent inhabitants, no roads, and not governed by any law. The land cover is sand, and several mountains are the only features. It is a “no man’s land” that resulted from a border dispute between Egypt and Sudan. Many people have tried grabbing this portion of land in vain. In 1899, the Anglo-Egyptian Condominium Agreement set the border between the two countries at the 22nd parallel. Later on, in 1902, the UK drew a separate administrative boundary. They hoped that the new boundaries would be an accurate reflection of land based on its use by the locals in the area. The new boundary placed Bir Tawil as part of Egypt. At the time, the Ababda tribe from Egypt used the land as grazing land for their animals. On the other hand, there was another piece of land called the “Hala’ib Triangle.” The area came under the control of the British governor of Sudan. At independence, Sudan claimed ownership of the Hala’ib Triangle. However, Egypt disputed the claim stating that the 1902 administrative boundary was temporary. As such, the Hala’ib Triangle belonged to Egypt, and the Bir Tawil was Sudan’s. 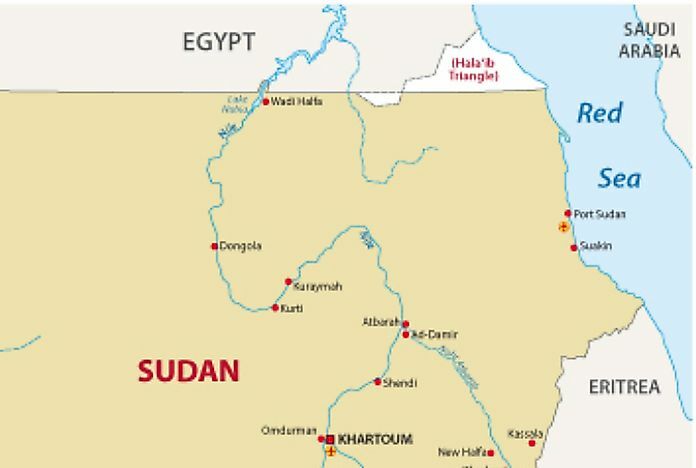 To date, Egypt and Sudan have never resolved their boundary dispute. The two countries do not want to claim ownership of Bir Tawil. According to them, it would imply that they had relinquished ownership of the Hala’ib Triangle which is not the case for either of them. One individual who tried to take possession of Bir Tawil was Jeremiah Heaton. In 2014, he made a journey to the land to make true his promise to his daughter, Emily. As she grew up, Emily always wondered whether she could ever be a real princess. So for her birthday present, Heaton decided to take ownership of his new country called the “Kingdom of North Sudan.” He would be the head of state, and Emily’s dream of being an actual princess would come true. After setting a flag on the land, he began a campaign to raise 250,000 dollars to develop his new “state”, which resulted in criticism. Instead of receiving praise for his actions, people labeled him a 21st-century imperialist. Ultimately, he realized that there was no neutral way of claiming ownership of a state. Another person who also claimed ownership of Bir Tawil in 2011 was Jack Shenker. Besides the two, many people have tried owning the disputed land by making online declarations. Taking ownership of Bir Tawil land is not as simple as planting a flag on it. Besides, any foreigner who tries to claim ownership of the African land will only invite conflict as was in the colonial period. It is best to let Egypt and Sudan resolve their dispute how and when they deem fit. For now, Bir Tawil remains unclaimed land. This page was last updated on November 3, 2017.